Apple officially announced its deal to buy popular headphones maker Beats Electronics and its related streaming music service, Beats Music, for $3 billion, the company announced on Wednesday. Previous reports had the price slightly higher at $3.2 billion. Beats co-founders Jimmy Iovine and Dr. Dre will join Apple as part of the deal, which will likely close by September, Apple said. The acquisition takes the form of a $2.6 billion in cash and around $400 million in stock. When the deal was first announced, Dr. Dre called himself "the first billionaire in hip hop." Whether or not that's true, he will definitely make a lot of money from the deal. 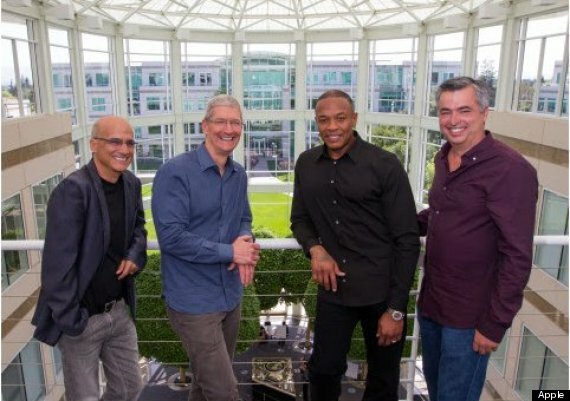 "I’ve always known in my heart that Beats belonged with Apple," Iovine said in the press release, which also included the following photo of new best friends Jimmy Iovine, Apple CEO Tim Cook, Dr. Dre and Apple's senior vice president of Internet software and services, Eddy Cue. The Beats purchase turned heads in the tech world, since Apple doesn't make as many high-profile acquisitions as Google, Facebook and its other Silicon Valley competitors. But the $3 billion buy won't hurt Apple's bottom line: With $159 billion in its coffers, the iPhone maker has more cash than any other non-financial company in the U.S., according to Moody's. Other critics of the deal wondered why a company known for the quality of its hardware would want to own Beats by Dre headphones, which don't have the best reputation among audiophiles. This April, a comprehensive Time magazine survey ranked Beats by Dre 17th among 18 headphones makers. Audio quality aside, Apple may be able to juice sales of the iPhone, its biggest money maker, by offering pairs of Beats along with it, The Atlantic's Derek Thompson argued. Any little increase in phone sales would make for a healthy boost to the company's profits, simply because the iPhone is so big for Apple.